Now, obviously nobody knows whether the brake pads are worn out or not, but our visibility is limited anyway. In the short term, we might see yet another bounce attempt, and again with no chance to hold, so whoever wants to go long should switch to lower times frames. Our tick chart does pretty well in such environment. Mid to long term, those who have been short can stay short, eventually cashing in some profit. Some may want to sell on breakout. Similar story as we can expect. ER reached stall level and is should now aim to targets given previously i.e. close on on 375. Sorry for yesterday... A LOT of work unfortunately distracted me from my daily report. Despite the fact we are on key levels, nothing major happened yesterday, so let's review the day ahead now. Trading range below key 406 level ahead of anticipated target as mentioned on previous report. While selling pressure could abate slightly with a likely slowdown near stall level (~390), we are still aiming at that target range made of stall level, Fib expansion target (384) and strong MM support (375). 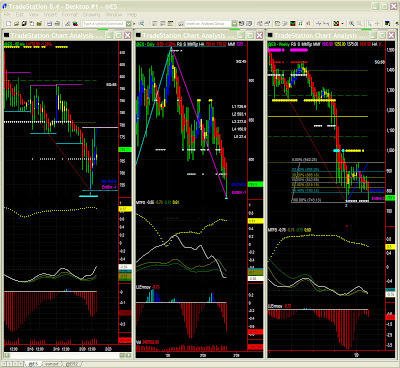 Indicators show some potential bounce to the high 410s before we get there even if such inflexion is not visible yet. As discussed in previous reports, ES is slightly ahead of ES as it already is on its 750 target. 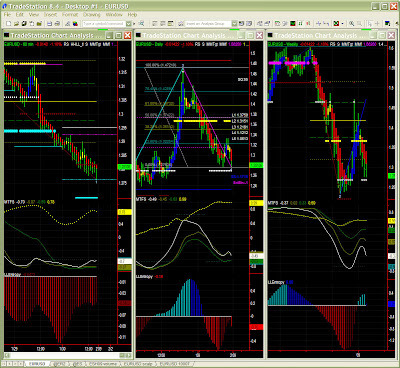 The pattern is however similar and the bounce is already visible. While leading a bit, the outlook remains the same: no recovery right now and ES test lows again. On the longer term, we can still believe in a double bottom scenario but we certainly have to see selling pressure dissipate. Oh well, when i said "ES could really sink deep" last week, i somehow didn't quite anticipate we would have such heavy selling, but it was witching day on Friday, thus adding to the high volatility environment. I added a commented chart on the technical blog, and we still have a strong correlation to our other Russell index (see article below), so we'll just glance at ES peculiarities here. MTFS here confirms a bounce potential in oversold territory, possibly to a Fib retracement level, on mid 780s or close to 800. Having said that, i wish to reiterate that we have no reason to go long right now, as there is no recovery potential right now. Same as ER, and as mentioned on the commented chart, the picture at this level is just as bearish. Without any change in dynamics and assuming 750 will hold (even if possibly breifly penetrated) the above scenario of prices being restrained in the lower half of our trading range is our best bet. We'll therefore check the key 812 level later on in case of a sudden bounce. Good call last week with our target just above 400. ER indeed is now sitting on a strong support level on the 60mins chart. Yet, we'll see that this may be a short lived reprieve only. Sometimes the timing is not ideal to assess what comes next. Indeed ER fell to 406 and almost broke it late in the day to only see a very mild bounce on traders squaring their positions ahead of the weekend. Technically a bounce to Fib PR1 is possible, but isn't likely at this vantage point. Should selling pressure abate (probable scenario), ER could stay for a while in this [406=437] price segment. To maybe help us draw an overall picture, ER at this level is very oversold with MTFS indicating a likely bounce (however limited in amplitude) at this level. This could confirm a return to Fib retracement level or even a test of the 437 level by mid week if volatility keeps on playing tricks on us. 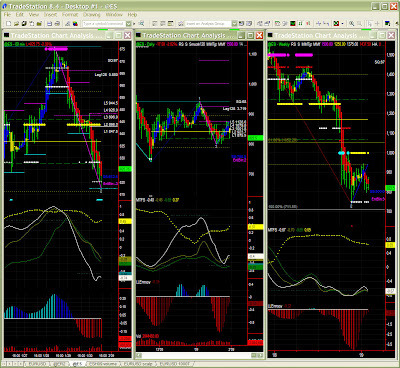 However, there is NO change in scenario, and the fall should then resume to the bigger Fib pattern expansion target. We therefore still aim at 380s if the 60mins support level breaks. Again, the bigger picture here supports the overall scenario here. MTFS and Entropy are still quite bearish. Last bar is just as red as the last five daily bars, so let's just try and see where this whole thing might stop. We've got a Fib retracement level just above 400, confirming Friday's support level, yet it is difficult to see what could stop ER from testing previous lows. Obviously, we'll watch lower time frames carefully to separate the cup & handle scenarios from its double bottom counterpart, the latter looking more probable. Note on EURUSD after reactions to my Friday's comments: short term players will certainly have jumped in the bandwagon (i.e. long) to Fib target. Longer term positions are still unchanged. The level 1.2695 is key level now. Markets are sometimes particularly easy to read. ES broke the 781 level to fall to the 770 area. There is one last stop at 767 before 750. We'll then see whether we are going for a double bottom on the weekly chart or whether it's all gloom and doom. We might see a sudden bounce followed for a while by the same trading range we've seen for a few months. ER has a Fib target on 414, but should aim straight at around 405-406. A quick note on EURUSD: likely to hit lows again also. Needless to say i was about spot on yesterday. Selling is not over yet, even if it should abate soon. ES is going to its [766-770] target while Entropy is now slowing. Only a volatility spike could take prices to target as we are already on stall level (781) at daily level. We have to see how the situation develops over the next few days to assess if ES will fall to 750 or lower. In the short term, behaviour around key 781 will be watched carefully. ER: while being just as oversold, ER is going to stall level at 414 and may well reach support level on 406. Selling pressure is still quite strong, but one cannot discard a possible bounce or even a short-squeeze on forthcoming levels. Confirming yesterday's bleak picture, ES is aiming south and 812 is only inches away from being history. We shall see today whether that level is tested again as a resistance now, or whether buyers have just given up. We do have some support just below 800 now, just to mitigate the otherwise bearish outlook of a much lower target on the daily chart. Same story for ER which technically is still on its 437 support level (more a [433-437] support range actually). We may see prices fall a full price segment (about 16 points apart) to reach the next Fib target around 418 to 420. 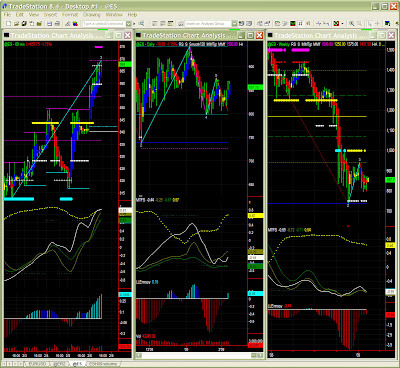 In the very short term, we have to observe index behaviour on their support level right now. Although very unlikely, we may see a last minute attempt to bounce on those levels. ER: We warned of a possible stall, and this is confirmed now. ER resistance level in the high 460s has turned from pivot to strong, so one could see a retracement to 1st Fib level. On higher time frames (daily, weekly), the outlook is a mildly bearish congestion. ES: Same story, and as we've said in previous reports, ES has easier to read lately. ES should now first reach Fib Expansion and possibly pivot level in the mid 840s. We however do not anticipate any change in our longer term outlook. Note: FX is no longer part of our free reports. Again, markets are very much correlated and we'll here only emphacize on specific prices and possible pattern differences. ES Daily: The uncertainty unraveled last week is still around, so we may have some more congestion until a Fib pattern comes out clearly. We remain cautiously bullish even if trading range lows can always be tested again (unlikely though). ES Weekly: Here again, we have to be particularly careful as Entropy is stalling, Swing is turning south again and MTFS is decidedly quite bearish still. Only that yellow bar gives us a glimpse of hope. Having said that, no gloom and doom here... Let's just watch how we break our trading range at daily level first. 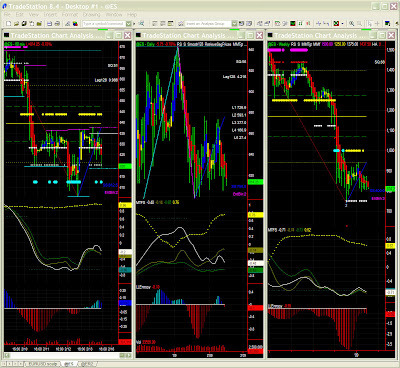 All we can say is that the trading environment on longer time frames should remain messy for a while. Due to an exclusitivity agreement, there will no longer be forex reports on this blog, so we'll jump in straight away with ER (RUT). 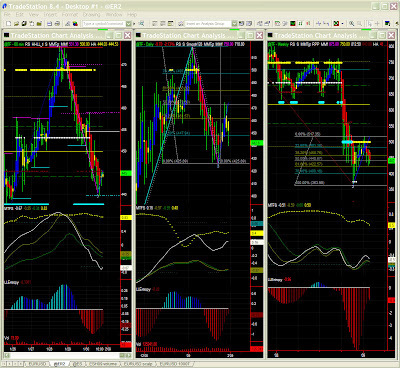 I advised to go for an aggressive long limit order to prepare for a nice up move or go market. I gave an indication of a pivot point (438) so i assume everybody got it more or less at the right time. ER 60mins: while being understandbly stopped at MM pivot line + Fib Exp target, there is still substantial buying pressure in overbought territory so in absence of major news, one should only see moderate profit taking. ER Daily: The picture is not so rosy here and it appears that we'll have to wait for Fib Exp 1 level (low to mid 480ss) to be reached to relax a bit. We can have some messy congestion hanging on for a while even if lows will probably be soon confirmed as passed as time goes by. Til then, caution is required. ER Weekly: While we still follow our favoured "cup & handle" type of scenario we have to acknowledge that last week's bar only turned yellow from red, and both MTFS and Entropy do not look too good yet. At the moment, we just have to watch that lows do hold on until buyer start coming back to the party. Test levels would then be in the [500-520] range. EURUSD has been hovering above 1.282 and selling pressure seems to be dissipating a little now. This is typical of a congestion on such a strong support level. There could be some acceleration once support is broken. We still have the same target as per previous reports. If we look at a good pivot point where prices could rise again, it could certainly be around yesterday's close (~444). Should it be lower, (and we have to acknowledge we're still in 'failed recovery' mode which could resume into full bearish mode) the ultimate test level remains 437 which was tested a few days ago. We'll therefore watch current levels carefully. Our favoured scenario is still cautiously bullish. ES: Same story at first sight, although the picture is slighly bleaker. The ultimate test level here is 812. Here again caution must be exercised. My crystal ball did a good job again on EURUSD... and this will be the last week for FX posts in terms of an exclusivity agreement. We shall gradually return to 2 posts a week on US indices as the financial crisis slowly comes to an end. So EURUSD bounced as anticipated and should now resume its course south. Selling pressure should however decrease so one may want to follow shorter intraday time frames. Once/if 1.282 is passed, we'll check 1.277 and then 1.2695 again. Our longer term outlook remains unchanged still. Here again, ER behaved as expected, bouncing a little below 437 (physicists will understand that support levels always contain a degree of elasticity on account of volatility). ER reached Fib PR1 and could higher, but not without a bit of range trading first. 437 could even be tested again. ES is also a little undecisive with a willingness to take off, but no real energy to do so right now. We should however eventually leave this trading range on the up side. Resistance levels are placed a few points apart from 828 to 844, so could be as many stumbling blocks indicating the way to recovery is bound to be a little bumpy. Again, markets are very nuch correlated and we'll here only emphacize on specific prices and possible pattern differences. ES Daily: Same uncertainty here, forcing us to evaluate the 813 key level on the 60mins chart very carefully. 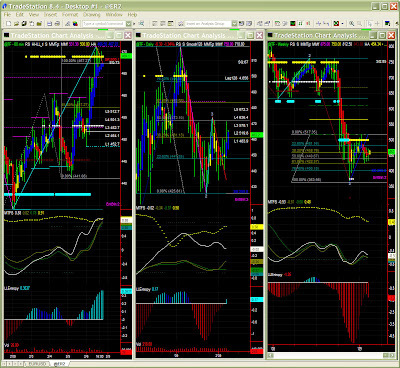 We here also have 2 conflicting Fib patterns whih could send prices either way, i.e. down to 782 then... 725! or otherwise up to 924. ES Weekly: Here again, we have to be particularly careful as while we have seen Entropy recovering and Swing toggling up, the MTFS pattern is still quite bearish and bars are 'bright' red. We however favour a positive scenario for ES, despite showing a few roadblocks along the way. We'll come back to those key levels later on (by end 1st quarter '09) but we do already see that on pivot confirmation, recovery could well stumble again near 1000 and 1250, both being strong Fib and MM levels. While being considerably oversold, EURUSD is now aiming straight towards 1.2695 Obviously this level is largely anticipated, so a bit of volatility ahead of (or on) target is likely. Our scenario then is a bounce to 1.295 which would be a test level going forward. Let's first wait for our target to be hit. 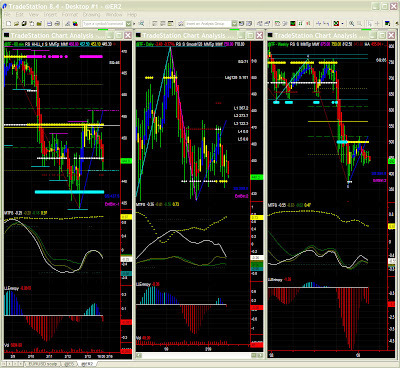 Our target over the next few weeks is still in the 1.24 area, which we shall confirm upon €/$ behaviour on test level. Swings are all UP and yet all bars are red or yellow at best thus indicating a willingness and unsuccessful attempt attempt so far to find support in this area. ER 60mins: As mentioned above, we do have early signs of a bottom indicated by Entropy recovery, MTFS white line trying to pick up in oversold territory, Swing toggling up etc. Yet, it seems almost inevitable that the market will try and hit its target around 438. That MM support level looks quite strong though, so we'll watch ER's behaviour carefully. ER Daily: Our configuration despite uncertainty in the last couple of weeks still sustains our scenario of a market recovery on a support to be confirmed still. 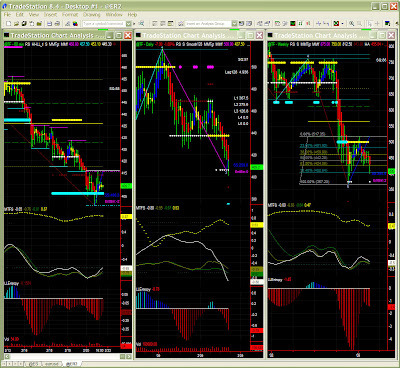 At this juncture, the pivot point could well be the 438 area already mentioned. As a reminder, i've been giving a "aggressive limit long" notice for long term players, with the additional caveat that this is a early warning only (bars are still red). Most traders will wait for pivot confirmation with blue bars. Furthermore, we have to remain cautious that we still have two potential opposite Fib patterns forming. ER Weekly: In agreement with our daily outlook, the weekly chart is also hesitant with Entropy failing to confirm it's recovery. We still favour a 'cup&handle' formation but we certainly have to wait for a confirmation of the forthcoming pivot (~438), blue bars, and at this time frame, see 500 clearly passed and tested for support. Again, one can try an aggressive limit long order with a stop near last year's lows, or wait and hop on the bandwagon a little later.